Mass drug administration (MDA) programmes for the control of lymphatic filariasis in Ghana, have been ongoing in some endemic districts for 16 years. The current study aimed to assess factors that govern the success of MDA programmes for breaking transmission of lymphatic filariasis in Ghana. The study was undertaken in two “hotspot” districts (Ahanta West and Kassena Nankana West) and two control districts (Mpohor and Bongo) in Ghana. 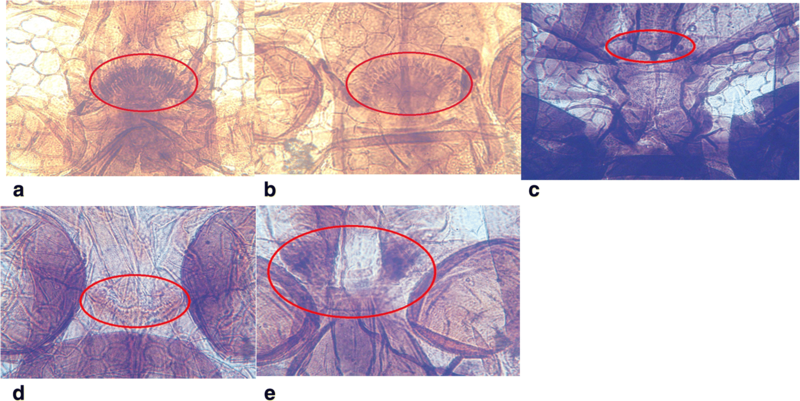 Mosquitoes were collected and identified using morphological and molecular tools. A proportion of the cibarial armatures of each species was examined. Dissections were performed on Anopheles gambiae for filarial worm detection. A questionnaire was administered to obtain information on MDA compliance and vector control activities. Data were compared between districts to determine factors that might explain persistent transmission of lymphatic filariasis. High numbers of mosquitoes were sampled in Ahanta West district compared to Mpohor district (F = 16.09, P = 0.002). There was no significant difference between the numbers of mosquitoes collected in Kassena Nankana West and Bongo districts (F = 2.16, P = 0.185). Mansonia species were predominant in Ahanta West district. An. coluzzii mosquitoes were prevalent in all districts. An. melas with infected and infective filarial worms was found only in Ahanta West district. No differences were found in cibarial teeth numbers and shape for mosquito species in the surveyed districts. Reported MDA coverage was high in all districts. The average use of bednet and indoor residual spraying was 82.4 and 66.2%, respectively. There was high compliance in the five preceding MDA rounds in Ahanta West and Kassena Nankana West districts, both considered hotspots of lymphatic filariasis transmission. The study on persistent transmission of lymphatic filariasis in the two areas in Ghana present information that shows the importance of local understanding of factors affecting control and elimination of lymphatic filariasis. Unlike Kassena Nankana West district where transmission dynamics could be explained by initial infection prevalence and low vector densities, ongoing lymphatic filariasis transmission in Ahanta West district might be explained by high biting rates of An. gambiae and initial infection prevalence, coupled with high densities of An. melas and Mansonia vector species that have low or no teeth and exhibiting limitation. Lymphatic filariasis is a debilitating disease affecting the health, productivity and wellbeing of infected individuals and communities [1, 2]. Over 90% of infections worldwide is caused by Wuchereria bancrofti and the remaining by Brugia species . Mosquitoes belonging to the genera Aedes, Anopheles, Coquillitedia, Culex and Mansonia (depending on their geographical location) are involved in transmission . In Ghana, the main vectors are An. gambiae and An. funestus senso lato (s.l.) and the minor are An. pharoensis  and Mansonia species . It is assumed that in areas where the primary vectors are Anopheles species, about 5–6 rounds of mass drug administration (MDA) should be effective in breaking transmission of lymphatic filariasis . This assumption did not consider confounding factors such as spatial heterogeneities which, when included in an intervention model, may give predictions that could exceed the 5–6 rounds of MDA even with > 65% MDA coverage for achieving lymphatic filariasis elimination in various endemic areas . A scenario modelled by Michael et al. suggested that with the current MDA regimen, Ghana is likely to eliminate lymphatic filariasis by 2020. However, the authors indicated that lymphatic filariasis transmission is focal due to a number of factors including spatial heterogeneities . This therefore implies that interventions should at best consider these unique factors in each endemic foci. In Ghana, MDA commenced in five districts in the year 2000, and was scaled up to cover all endemic districts by 2006 . Hence, by 2014, each endemic district had received at least eight rounds of MDA, which was expected to have interrupted transmission. However, evaluations revealed that infections still persisted in 22 districts (termed “hotspot” districts) with microfilariae (mf) prevalence greater than 1% . The persistent transmission of lymphatic filariasis may be influenced by different factors [11–14]. These include pre-control lymphatic filariasis prevalence and infection intensity, population treatment coverage and compliance, vector competence and vectorial capacity and socio-cultural factors. Wuchereria bancrofti transmission in a vector population depends on the ability of mosquitoes to ingest and support the development of mf . Importantly, mf ingested is affected by cibarial teeth, a physical barrier in the foregut of mosquitoes. This may influence the dynamics of filarial transmission and impact on control measures . Additionally, the initiation of infections for W. bancrofti depends on the availability of vector species and high vector biting rates . The success of MDA also depends on the extent of the population treatment coverage. The recommended population treatment coverage by WHO should exceed 65% of the endemic population . Indeed, such MDA treatment coverage rates, coupled with effective compliance (i.e. willingness of individuals to ingest the drug), are necessary for a successful MDA programme. In Ghana, lymphatic filariasis transmission persists in several districts, even after more than ten rounds of MDA, despite reported average treatment coverage rates of > 65%. Consequently, these districts are labelled as “hotspots”. Other districts have successfully passed a transmission assessment survey (TAS), and hence, MDA has been stopped . For the current study, the latter districts are termed “control”. Our objective was to determine factors that influence the transmission of lymphatic filariasis, in selected hotspots and control districts in the Western and Upper East regions of Ghana. The study was conducted in eight communities from four districts in Ghana. There were four communities in two hotspot districts; namely, Asemkow (geographical coordinates 4°82’ N latitude, 1°88’ W longitude) and Antseambua (4°85’ N latitude, 1°93’ W longitude) in the Ahanta West district; and Badunu (10°96’ N latitude, 1°06’ W longitude) and Navio Central (10°96’ N latitude, 1°05’ W longitude) in the Kassena Nankana West district. Additionally, there were four communities in two control districts; namely, Balungo Nabiisi (10°93’ N latitude, 0°84’ W longitude) and Atampiisi Bongo (10°91’ N latitude, 0°82’ W longitude) in the Bongo district and Ampeasem (5°04’ N latitude, 1°94’ W longitude) and Obrayebona (5°00’ N latitude, 1°87’ W longitude) in the Mpohor district. The Ahanta West and Mpohor districts belong to the high rain forest vegetation climatic zone, whilst Kassena Nankana West and Bongo districts have sub-Sahelian climate (Fig. 1). Entomological surveys were conducted monthly in all the study communities. Mosquitoes were collected over a 13-month period from the beginning of July 2015 to the end of July 2016. Samples were collected using window exit traps, pyrethroid spray catches and human landing catches . In each district, there were 16 community vector collectors (CVCs). Each district had two communities selected and the eight CVCs divided into two teams (four per team). Human landing catches involved two CVCs sampling indoor, and the other two outdoor in two different households simultaneously for every sampling night. Mosquitoes were collected hourly from 21:00 to 5:00 the next morning. Starting human landing catches earlier instead of the 21:00 would not have had any significant impact on the results as relatively few An. gambiae s.l. bite before 21:00 in the Upper East Region . This time was therefore replicated in other districts to have a uniform setting. Pyrethrum spray collection was done by the CVCs from 5:00 to 8:00 in up to ten different households. Before every sampling night, two window exit traps were fixed in two different households at 18:00 and removed after 8:00 the next morning. Sampling was done twice a month in two different households every catch night in each community. All mosquitoes were identified at species level, using morphologic identification keys [20, 21]. Molecular identification was done by extracting DNA from mosquito legs using a standard protocol described by Xu et al. . Sibling species of An. gambiae complex were identified using polymerase chain reaction (PCR), as described by Scott et al. . This was followed by restriction fragment length polymorphism (RFLP) to distinguish the species An. coluzzii and An. gambiae senso stricto (s.s.) . In general, the rationale for selecting mosquitoes was aimed at having proportional numbers of mosquitoes in the various districts dissected for the estimation of infection and infectivity. Samples collected with human landing catches were used to estimate infection, infectivity and annual biting rate (ABR). For estimation of infection and infectivity rates, An. gambiae samples were dissected and observed for the various stages of the parasites . The heads of 224 mosquitoes (anophelines and culicines) consisting of 14 mosquitoes per species for each district were selected with reference to similar studies [11, 25, 26]. The mosquito heads were detached and placed in a 1.5 ml microcentrifuge tube containing clearing medium (consisting of equal volumes of chloral hydrate and phenol) . Tubes were kept in the dark for about a week to clear the mosquito heads . Clearing took longer for dark (highly melanised) mosquitoes, such as Aedes species (approximately one month). After clearing, the mosquito heads were placed on a clean glass slide and a drop of Puri’s (mounting) medium was added before covering with a cover slip. The heads were mounted dorso-ventrally to enhance viewing and counting of the cibarial teeth. The cibarial armature was observed under a compound microscope at X 1000 magnification. The mounted mosquito head was kept at room temperature for at least 1 week and the total number of cibarial teeth counted and recorded. Our study pursued a cross-sectional design with questionnaires randomly administered to individuals in the various districts. The questionnaire sought to obtain information about treatment compliance and involvement in vector control activities in the study districts. Before this study, the questionnaire was validated using the results of a pre-test. This was to serve as a quality control. [(Number of mosquitoes caught) / (Number of catchers × number of catch night)] × 365 days [17, 27, 28]. A total of 31 064 mosquitoes were sampled from all the study areas. There was a significant difference in the number of mosquitoes collected from Ahanta West district compared to Mpohor district in the Western region (F = 16.09, P = 0.002). No difference was observed between hotspot and control districts for the Upper East (F = 2.16, P = 0.185). The mosquitoes collected in this study were Aedes species, An. coustani, An. gambiae s.l., An. pharoensis, Culex species and Mansonia species. An. gambiae s.l., which serves as the principal vector of lymphatic filariasis in Ghana, was the most abundant mosquito species sampled in hotspot and control districts in both the Western and Upper East regions. Relatively higher numbers were sampled from the Ahanta West district (Table 1). Figure 2 shows the total number of An. gambiae mosquitoes sampled for the various months from all the study areas. The ABR for An. gambiae mosquitoes sampled by human landing catches in Ahanta West, Mpohor, Kassena Nankana West and Bongo districts were 15 987, 3604, 376 and 306 bites per person, respectively (Table 2). There was a significant difference in ABR between Ahanta West and Mpohor districts (F = 15.16, P = 0.001), but not between Kassena Nankana West and Bongo districts (F = 0.13, P = 0.718). Mosquitoes belonging to the genus Mansonia were the second most abundant sampled in Ahanta West district (n = 2434) compared to Mpohor (n = 80). The Upper East region, however, had Culex being the second most abundant species with relatively high numbers sampled from Kassena Nankana West district (n = 879) compared to Bongo (n = 626). In Ahanta West district, more Culex species were collected compared to Mpohor district. Relatively low numbers of Aedes, An. pharoensis and An. coustani were sampled from all study areas in the Western and Upper East regions. Molecular identification of the An. gambiae complex showed that An. gambiae s.s., An. melas and An. arabiensis were the only species identified as sibling species. An. arabiensis were identified in both hotspot and control districts in the Upper East region, whilst An. melas were found only in Ahanta West district in the Western region. Further molecular analysis of An. gambiae s.s. indicated that An. coluzzii (previously the M form of An. gambiae s.s.)  was the only species in the study areas. A total of 1116 mosquitoes were selected for the 13 months spanning both wet and dry seasons in all districts. Ahanta West, Mpohor, Kassena Nankana West and Bongo districts had a total of 320, 368, 217 and 211 mosquitoes dissected, respectively. A total of eight mosquitoes were found positive for the various stages of the filarial parasite (L1, L2 and L3), with two samples being infective (L3). All samples found positive were An. melas found only in the Ahanta West district. The average infection and infectivity rates were (0.025 [2.5%], 95% CI: 0.8–4.2) and (0.006 [0.6%], 95% CI: 0.0–1.5) respectively. The presence of W. bancrofti was confirmed . Dissected samples from Mpohor, Kassena Nankana West and Bongo districts all tested negative for filarial parasites. Out of 224 mosquito heads processed, 140 samples properly cleared, and hence, were used for cibarial armature analysis. These samples were from both hotspot and control districts. The observation of the cibarial teeth of An. gambiae complex all showed that the teeth were sharp, pointed and long, but relatively fewer than that of An. pharoensis, which had pointed deep–rooted narrow based teeth. Culex species had the highest number of teeth, which were short, small sized and blunt. Aedes, Ma. uniformis and Ma. africana species had no cibarial teeth. The above description for the structure and shape of the cibarial teeth was similar for all mosquito species from hotspot and control districts in the two regions (Table 3). The structure of cibarial armatures of the various species are shown in Fig. 3. The mosquito species with the highest mean number of teeth was observed among Culex mosquitoes for both hotspot and control sites in the Western and Upper East regions, and the lowest observed in An. melas, which was found only in Ahanta West district (Table 3). There were no significant differences in the mean number of teeth between An. coluzzii (F = 2.12, P = 0.243) from hotspot and control study areas in the Western region. The same was observed for Culex (F = 3.00, P = 0.250) from this region. Results from Bongo and Kassena Nankana West districts also showed no significant differences in the mean number of teeth for An. coluzzii (F = 0.63, P = 0.277), Culex (F = 0.58, P = 0.231) and An. pharoensis (F = 0.57, P = 0.363). Cibarial armatures of mosquitoes from Western and Upper East regions, Ghana, July 2015 to July 2016. a. An. gambiae complex, b. An. pharoensis, c. Aedes species, d. Culex species and e. Mansonia species. The cibarial armatures of the mosquito species Culex, An. gambiae complex and An. pharoensis have cibarial teeth present. There are no cibarial teeth present for Aedes and Mansonia species. Analysis of MDA coverage data showed that the treatment coverage for the various years in both Ahanta West and Mpohor districts were above 65%. However, in the Upper East region, Kassena Nankana West and Bongo districts had greater than 65% MDA coverage for all years indicated except in 2003 for Kassena Nankana West and 2004/5 for Bongo districts (Fig. 4). By 2016, Ahanta West, Mpohor, Bongo and Kassena Nankana West districts had been involved in 16, 11, 13 and 15 rounds of MDA, respectively. However, there were no MDA data for some of the years (from 2000 to 2014) in all the districts. Data were absent for Mpohor, Kassena Nankana West and Bongo districts for 2001. Ahanta West/Mpohor and Bongo had no data for the years 2002 and 2010, respectively. All districts, however, had no data for 2007, 2008, 2009, 2011 and 2012. A retrospective assessment of baseline mf and antigen prevalence for the various districts showed high baseline mf and antigenaemia prevalence for all districts, except Mpohor where zero prevalence was reported for both mf and antigen. The baseline mf and antigen prevalence for Ahanta West, Kassena Nankana West and Bongo districts were 19.5 and 32.8%, 29.4 and 45.3%, 16.7 and 21.2%, respectively (Table 4). Questionnaires from 438 individuals (229 females, 209 males) were analysed in the four districts from the Western and Upper East regions. The age distribution of the respondents ranged from 15 to 92 years (mean = 37.4 years; median = 35 years). Half of the respondents were farmers (n = 220; 50.2%), 62 were fishermen (14.2%), while 26 were unemployed (5.9%) or involved in other occupations (n = 130; 29.7%). Questionnaire data showed that out of the 110, 108, 108 and 112 respondents from Ahanta West, Mpohor, Kassena Nankana West and Bongo districts, 90.0, 53.7, 87.0 and 89.3%, respectively, affirmed their participation in MDA activities. In relation to MDA compliance, the percentages of individuals shown to have complied with the previous five rounds of MDA were 47.3, 3.7, 31.5 and 9.8% for Ahanta West, Mpohor, Kassena Nankana West and Bongo districts, respectively. Our results revealed that relatively high proportion of individuals from Mpohor district did not participate in MDA activities (Fig. 5). Information on vector control activities from respondents in our four study districts indicated that bednet usage and indoor residual spraying were relatively high: 69.1–91.1% for bednet and 38.9–85.5% for indoor residual spraying. It is estimated that for the interruption of lymphatic filariasis transmission, microfilariae prevalence should be less than 1% or antigen prevalence less than 2% . These criteria are used for the roll out of intervention programmes in all lymphatic filariasis endemic regions. In Ghana, control of lymphatic filariasis by means of MDA has been going on for almost two decades. At the time of the current study in 2016, most endemic communities should have interrupted transmission and began transmission assessment survey (TAS) or post-MDA surveillance. However, there are endemic foci still having transmission even after several rounds of MDA . Mathematical model simulations suggest that different countries may have different mf breakpoints for interruption of lymphatic filariasis . Hence, there is a need to have a critical look at the 1% mf or 2% antigen thresholds used in various endemic regions for interruption of transmission. The reasons contributing to this persistent transmission are not clear. Vector species and abundance , vector control activities , vector competence, MDA compliance and therapeutic coverage , drug efficacy  and possible vector-parasite combinations  are important factors that govern the transmission of lymphatic filariasis. However, in any particular situation either all or some of these factors may be important and need to be understood to resolve any ongoing transmission. Results derived from the current study showed that, with the exception of An. melas, mosquito species composition was similar in hotspot and control districts. However, higher numbers of mosquitoes were obtained from hotspots, compared to control districts in the same ecological zone. The transmission of lymphatic filariasis is significantly influenced by vector density . The consistent high number of mosquitoes collected from Ahanta West compared to Mpohor district might be contributing to the persistence of lymphatic filariasis transmission in Ahanta West district after several rounds of MDA. Additionally, on-going lymphatic filariasis transmission in Kassena Nankana West district might be explained by the relatively high number of mosquitoes collected in this district, compared to Bongo. Vector-parasite density dependent relationships of limitation, stable transmission of lymphatic filariasis even at low mf levels, and facilitation, transmission of lymphatic even at high mf levels [19, 34], are known to influence elimination of lymphatic filariasis. Members of the An. gambiae are generally considered to exhibit facilitation and hence at low mf levels are not efficient. It is expected that with An. gambiae serving as major vector, lymphatic filariasis should have been eliminated in these districts. An melas, which is part of the An. gambiae complex, has been shown to exhibit limitation [11, 19, 35], and hence, able to pick mf at low parasitaemia and sustain their development to the infective stage. An. melas observed only in Ahanta West district might explain why transmission has been sustained, though at low mf levels. Additionally, Mansonia species are known to exhibit limitation . Higher numbers of this species were sampled from Ahanta West than Mpohor District, and very few in Kassena Nankana West and Bongo districts. Mansonia species have been incriminated as one of the vectors involved in lymphatic filariasis transmission in Ghana . While Mansonia were not examined for W. bancrofti in this study, its presence in relatively high numbers in Ahanta West district could also be an additional factor sustaining the transmission of lymphatic filariasis in this area. Culex mosquitoes had higher numbers sampled in Ahanta West compared to Mpohor district, while similar numbers were collected in Kassena Nankana West and Bongo districts. Culex mosquitoes exhibit limitation  and transmit lymphatic filariasis in East Africa . Appawu et al. showed that Culex species in Ghana are refractory to W. bancrofti and do not support their development to the infective stage. However, studies in Nigeria [36, 37], showed that Culex transmit lymphatic filariasis. Cibarial teeth in mosquitoes act as a physical barrier and influence the transmission dynamics of lymphatic filariasis. The cibarial teeth number and shape influence mf intake by inflicting lacerations on ingested parasites [11, 15]. However, more Mansonia species, lacking cibarial teeth and competent vectors at low parasitaemia were collected in Ahanta West. Furthermore, An. melas with relatively fewer cibarial teeth numbers was found in Ahanta West, while this species was absent in Mpohor district. All mosquito species common to Ahanta West, Mpohor, Kassena Nankana West and Bongo districts had similar cibarial teeth numbers and shape. The residual transmission of lymphatic filariasis in an area may be influenced by differences in the distribution of vectors . In our study, An. melas was found only in Ahanta West district. Another factor is the vector-parasite combinations to lymphatic filariasis infection at low mf prevalence. An. gambiae complex exhibit facilitation but An. melas belonging to this complex exhibit limitation. This may account for differences in transmission potential within the An. gambiae complex . The competence of An. melas to W. bancrofti infection at low mf prevalence will contribute to persistent lymphatic filariasis transmission. As suggested by our dissection data, the presence of L3 in An. melas proves its involvement in ongoing transmission of lymphatic filariasis in Ahanta West district. Analyses of MDA coverage data obtained from the National Neglected Tropical Disease Control Programme revealed at least 65% MDA coverage for all the districts. It has been hypothesised that annual MDA with adequate consistent coverage of at least 65% should make elimination possible . This hypothesis was based on early models for implementing MDA intervention programmes without possibly considering spatial heterogeneities. Spatial heterogeneities when adopted by intervention models may give predictions that could exceed the 5–6 rounds of MDA recommended to interrupt lymphatic filariasis transmission. This in turn lengthens the period needed for achieving lymphatic filariasis elimination at a given endemic area. For Ghana, it was predicted that lymphatic filariasis could be interrupted by 2020 as revealed by mathematical modelling . The authors however suggested that lymphatic filariasis transmission is focal due to a wide range of factors in endemic areas . This therefore implies that intervention programmes rolled out in endemic areas should be specific and targeted in each endemic foci. Community compliance to MDA is important in understanding persistent transmission of lymphatic filariasis. The evaluation of the districts’ participation in the previous five rounds of MDA indicated a higher percentage of respondents from Ahanta West district (47.3%) and Kassena Nankana West district (31.5%), reporting to have taken the drugs all five times, compared to much lower rates in Mpohor (3.7%) and Bongo (9.8%). Thus the ongoing transmission of lymphatic filariasis in Ahanta West may not be due to MDA compliance, but driven by other factors. The results from this study indicated higher bednet usage among community members in control compared to hotspot districts. This observation may have contributed to the control of lymphatic filariasis in the control districts. In Gambia, for example, Rebollo and colleagues observed that interruption of lymphatic filariasis transmission could have possibly been due to the extensive national bednet usage for malaria control [31, 39]. It should be noted that Gambia used bednets without MDA and at present, there is no explanation on how lymphatic filariasis was eliminated aside bednet usage. Indoor residual spraying activities in all districts were high, except for Mpohor district. AngloGold Ashanti Malaria Control Ltd., a subsidiary of AngloGold Ashanti (AGA), from 2013 to 2015 conducted indoor residual spraying activities twice yearly in about 40 districts in Ghana. Due to limited resources, indoor residual spraying was done only in districts with high malaria prevalence, excluding Mpohor (unpublished data, AGA). However, it is possible that other private agencies aside AGA sprayed a few communities in Mpohor, explaining the low percentage of respondents (38.9%) affirming indoor residual spraying activities. 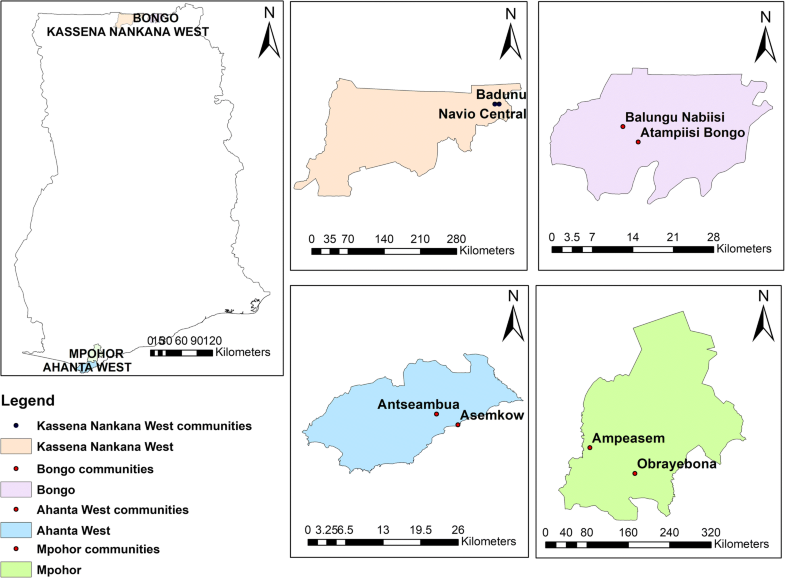 While the indoor residual spraying data in the Western Region may not be sufficient to draw conclusions, the results from the Upper East Region on the other hand, indicate that the lower vector control activities in Kassena Nankana West compared to Bongo District could be a possible indicator for control of lymphatic filariasis transmission in control districts. Thus, supporting the important role vector control plays in the control of lymphatic filariasis . There were a couple of limitations to this study. First, Mpohor was selected as a control district, although retrospective analysis of data revealed a zero prevalence at the inception of MDA in the year 2000. A study site with prevalence similar to Ahanta West district and with successful MDA treatment history would have been preferable. Second, the MDA data collected by the National Neglected Tropical Disease Control Programme could not be verified. An earlier study has shown MDA data reported by the programme to be inaccurate . There were also some missing MDA data for some of the years in all the study districts. The Global Programme to Eliminate Lymphatic Filariasis (GPELF) aims at interrupting lymphatic filariasis transmission. This is based on an estimated duration of 5 years at 1% mf prevalence, which might not be feasible in all endemic areas. It is important to understand the local factors responsible for persistent transmission of lymphatic filariasis in a given area. In our study areas, transmission of lymphatic filariasis in hotspots despite many years of treatment could not be attributed to low MDA coverage and compliance when compared to control districts. In Ahanta West district, our data suggests high biting rates of vector species in the An. gambiae complex, initial infection prevalence rates and low vector control to ongoing lymphatic filariasis transmission. Additionally, the presence of An. melas and Mansonia, with less or no cibarial teeth may further contribute to transmission. In Kassena Nankana West district, transmission dynamics could be explained by the presence of relatively low numbers and biting rates of An. gambiae complex together with initial infection prevalence as reported by our study. Furthermore, low densities of Mansonia and the absence of An. melas may be reasons why no infections were recorded in this district. We are grateful to those who supported with logistics and helped with the field and laboratory activities; Irene Offei Owusu, Sampson Otoo, Worlasi Debi Kartey-Attipoe, Joannitta Joannides and Daniel Okyere of Noguchi Memorial Institute for Medical Research. We thank Betty Nambuusi and Julius Ssempiira at Swiss Tropical and Public Health Institute for help with data analysis. We acknowledge the immense support we received from the head and the staff of the Office of the National Neglected Tropical Diseases Control Programme of the Ghana Health Service for furnishing us with coverage and prevalence data. The full cooperation of the village chiefs, field workers, elders and community members at the study sites are greatly appreciated. This study was supported by SightSavers International, Ghana and the Centre for Neglected Tropical Diseases, Liverpool School of Tropical Medicine. SPB is grateful to the “Amt für Ausbildungsbeiträge” of the canton of Basel-Stadt for a PhD fellowship. The funders played no role in the design of the study, sample collection, analysis and interpretation of results or manuscript preparation. The datasets analysed during the present study are available from the corresponding author (SPB) upon reasonable request. All the authors have contributed significantly to this study. DAB conceived the study, with specific input from SPB, JHNO and DKdS. Supervision and implementation of field and laboratory work was done by SPB, JHNO, OKA, MAA, SKD and DKdS. Data were analysed by SPB, JHNO and KKF. The first draft of the manuscript was prepared by SPB. The manuscript was revised by JHNO, KKF, EE, DA, CA, MAA, BGK, MDW, DKdS, SKD, JU and DAB. KKF, BGK, DKdS, SKD, JU and DAB provided advice and final editorial feedback prior to manuscript submission. All authors read and approved the final version of the manuscript. This study was approved by the institutional review board of the Noguchi Memorial Institute for Medical Research (Accra, Ghana; reference no. CPN 077/13–14) and the institutional research commission of the Swiss Tropical and Public Health Institute (Basel, Switzerland; reference no. FK 122a). All CVCs consented verbally to participate in the study. Albendazole and ivermectin were administered to CVCs before mosquito sampling commenced. Arrangement was also made with the nurses at the community-based health planning and services (CHPS) compound to provide treatment for CVCs who reported at their facility and tested positive for malaria.